Risa is an ardent educator, environmentalist, and urban homesteader! She completed her B.A. Honours at Queen’s University in Comparative Religious Studies, and her M.A. at the Centre for the Study of Religion at the University of Toronto, focusing on Contemporary Jewish Environmental Ethics. Upon graduating, Risa moved to rural Connecticut where she worked as a Jewish environmental educator at the Teva Learning Centre for three years. 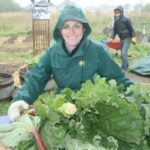 She then transitioned into small-scale organic farming as a member of the Adamah Jewish Farming Fellowship where she grew vegetables on a four-acre farm, worked in a raw goat-milk dairy, and dabbled in the art of fermentation. In 2008, Risa returned to her native Toronto to work as the Director of Shoresh and to establish the Kavanah Garden, bringing together her experience in Jewish outdoor education with her love for Canadian soil and the plants and people that it sustains. In 2010, Risa was profiled as a Woman to Watch by PresenTense Magazine and in 2012 she was honoured to be selected as a fellow in the prestigious Joshua Venture Group Dual Investment Fellowship. In 2013, shortly following the birth of her daughter Ayda, Risa was awarded the Covenant Foundation’s Pomegranate Prize for exceptionalism in Jewish Education. Risa believes that growing food sustainably is an expression of her deeply-rooted Jewish ethics. Her favourite vegetable is the beet. Sabrina began working with Shoresh in 2011 after spending six years working and volunteering in the Jewish Food Movement in New York and Israel. She participated in the Adamah Jewish Farming Fellowship in 2005, graduated from the Eco-Activist Beit Midrash in Jerusalem in 2006, and worked as the program assistant for Hazon from 2006-2007. Upon returning to Toronto, Sabrina got an M.A in Environmental Studies from York University with a focus on pollinator protection in urban centres. 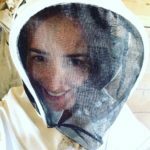 In 2010, Sabrina was awarded the Canadian Pollinator Advocacy Award from the North American Pollinator Protection Campaign, and in 2014 she was selected to participate in TENT: Food NYC, a week-long program exploring food and Jewish culture in New York City. Sabrina is Shoresh’s resident beekeeper and her favourite vegetable is cauliflower. Now in his third year working for Shoresh, Jared is thrilled to continue to share his love of nature with the community. Jared completed a Bachelor of Commerce at Dalhousie University, while spending time exploring the coastal trails in Nova Scotia. He proceeded to work for three different carsharing services across Canada helping to reduce the number of vehicles on the road. 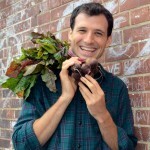 His interest in healthy food and sustainable living led him to become a certified nutritional practitioner from the Institute of Holistic Nutrition. Over the years, Jared has volunteered for a number of causes including organic farming in Israel, rainforest conservation in Ecuador, and food security in Toronto. He recently completed the year long Jewish, Outdoor, Food, Farming, and Environmental Education (JOFEE) fellowship certificate program joining the ranks of leaders within the field across North America. He feels deeply connected to his Jewish roots and is excited to learn and teach about how environmental engagement can be part of Jewish life. His favourite vegetable is kale! Beth is an avid environmentalist, outdoor enthusiast, and local food lover who loves connecting people to their environment through experiences in nature. She’s been involved with Shoresh since a summer internship in 2010, has been volunteering ever since, and is thrilled to rejoin the Shoresh team. Her interest in the environment and sustainable agriculture began during her BSc in physical geography at Queen’s University, where she was part of a group of students that established a farmers’ market on the Queen’s campus. Her MA in geography and environmental studies from the University of Toronto focused on the interconnections between water, energy, and food resources. Beth has worked at a number of environmental non-profits and startups, and volunteers as an environmental steward with the City of Toronto and the Toronto Region Conservation Authority. Beth’s favourite vegetable is a tie between romano beans and spaghetti squash. Mira has been enthusiastically involved in the Jewish environmental community, as a volunteer with Shoresh and a fellow at Adamah in Falls Village, Connecticut in 2018, where she practiced organic farming, Jewish spirituality, and food preservation. As an activist and community organizer, Mira is excited about sustainability, food and environmental justice. She is a passionate DIYer, sharer, biker, and veggie conscientious baker. She completed her Bachelors in Psychology at York University in 2018. Mira has been a student and organizer of Jewish education her whole life, with years of experience in child-centered programming. She is keen to develop programming that makes Jewish nature-based education fun, accessible, and meaningful. Mira’s favourite vegetable is any sort of locally grown tomato! 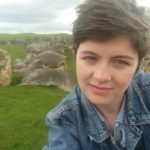 Karina began volunteering with Shoresh in 2018 after finishing her BA in Environment and Urban Sustainability abroad at the University of Stirling in Scotland, and is excited to be part of the Shoresh team! 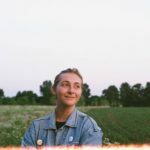 She is passionate about environmental education, bridging the gap between sustainability and accessibility, and is an avid film photographer. Karina has worked as an outdoor educator, a researcher working on projects ranging from sustainability at Canadian festivals to improving culinary trails in Ontario, and on an urban farm where she took care of 99 free-range chickens. For Karina, applying an environmental and nature-based focus to Jewish teachings and practices is her go-to when it comes embracing Judaism and spirituality. She will be beginning her Masters in Environmental Studies with a specialization in Sustainable Education at York University in September 2019. Her favourite “vegetable” is fungi – morel mushrooms to be exact!